Nothing ever really goes to plan. The multitude of options available to us at any one time makes it hard to know where we will end up. Unless it’s time to go to the pub, because that is a given. This indecisiveness through an excess of options affects the custom motorcycle world as well, with culture/drivetrain/performance/bike styling choices making it hard to settle on one result. This is what happened with today’s feature bike, the latest offering from Indonesian bike builders Studio Motor. Over the course of the build process the engine capacity tripled in size and gained a nationalist motif, all while staying true to the café racer spirit. 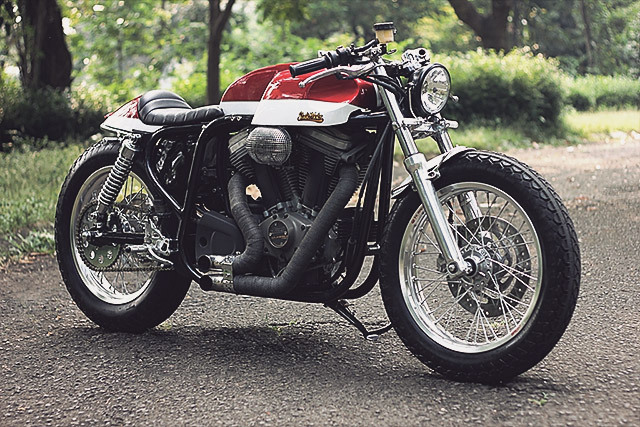 Built from the ground up using Indonesian ingenuity in the face of a limited custom bike scene, Studio Motor knows certainly knows the best options when it comes to bringing a bike to life. Ladies and Gentleman, we’d like to introduce you to ‘The Patriot’.